Dirty Tile and Grout? Not With Us Around! The trend in flooring over recent years has been to install more and more stone. The beauty of tile flooring is hard to beat, and it’s durable, luxurious, decorative, and very practical in common traffic areas. The majority of the time, a very light or white color is chosen for the grout in between the tiles. What’s the downside? Well, you probably already know. How Do We Clean Stone Flooring? With today’s cleaning technology, it can be done a lot better than it was scrubbing machines a long time ago. 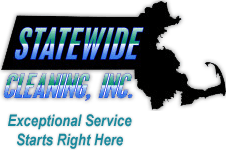 Statewide Cleaning has the proper tools and cleaning agents to clean ceramic tile, quarry tile, brick, smooth cement, terrazzo, marble, porcelain, slate, and much more. Our method is highly effective in restoring the natural beauty of your floors. It’s quick and not messy in the least! - Prep Work: We sweep the flooring of debris like sand, crumbs, foot traffic soils. - Apply Stone Cleaning Agents: These loosen the deeply embedded grunge and get it ready to be rinsed by our tools. - Use our Specialized Tools: These are high powered rinsing tools that blast away years of grime that lives deep inside the pores of the stone and grout. - Rinse and Finish: Light mopping and final grout work. - Optional Sealing: Apply a protective coating to your tile and grout.